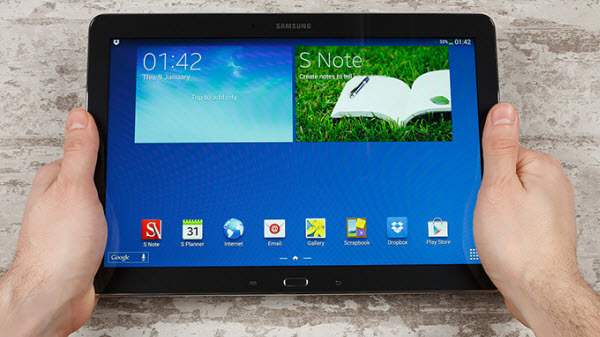 Samsung Galaxy Note Pro 12.2 review: A large-screen Android tablet with lots of features – some of them quite unsual. The Manute Bol of tablets, the 12.2-inch Samsung Galaxy Note Pro 12.2 provides a larger display than nearly all other tablets on the market. But this octa-core-powered Android device is more than just a supersize slate, offering deep pen integration and a host of productivity-friendly features, such as a souped-up Multi Window mode that lets you run four apps at once. There’s also a powerful office suite and remote-control software for your PC. With a starting price of $749, the Galaxy Note Pro 12.2 is more expensive than most of its competitors, but if you’re comfortable holding a tablet this large, it can help you get some serious work done. The Verdict: The Galaxy Note Pro 12.2 makes the most of its huge screen with powerful multitasking features and productivity apps — if you’re willing to live with its big size and price. At 11.64 x 8.03 x 0.31 inches and 1.6 pounds, the Samsung Galaxy Note Pro 12.2 is one of the largest tablets on the market, but it’s not the heaviest or thickest. This slate weighs much less than the 10.81 x 6.81 x 0.53-inch, 2-pound Microsoft Surface Pro 2, despite the latter’s smaller, 10.6-inch display. However, the Note Pro 12.2 felt rather heavy, and we simply could not grip it one-handed for long periods of time. Instead, we had to either place a single hand under the tablet, which felt a bit precarious; hold it with two hands; or rest it on our lap or a flat surface. The Samsung Galaxy Note 10.1 — which starts at just $499 and has the same processor, screen resolution and most of the same apps — weighs just 1.2 pounds and is significantly more one-hand-friendly at 9.75 x 6.75 x 0.31 inches. The 1.05-pound iPad Air and its 9.7-inch screen are also significantly more portable. The Galaxy Note Pro 12.2 has the same aesthetic as the Galaxy Note 3 phone and Galaxy Note 10.1, complete with a chrome-colored accent, glossy black bezel and faux-leather back. Like its siblings, the Note Pro 12.2 comes in black or white and has a physical home button, along with two capacitive buttons for navigation. A stylus port sits on the right side, along with a microSD Card reader for memory expansion and a USB 3.0 port for charging or connecting peripherals. The Galaxy Note Pro 12′s 12.2-inch, 2560 x 1600-pixel display provided sharp images and vibrant colors in our tests. When we watched a 1080p video trailer for “Iron Man 3,” the red in the hero’s armor and the blue in an oxygen tube appeared very prominent. Fine details, such as battle scaring on a helmet and wrinkles in Ben Kingsley’s face, were easy to make out. Because it has the highest resolution on the market, the Samsung Galaxy Note Pro 12.2 has a very strong 247 pixels-per-inch. However, the iPad Air’s 2048 x 1536 display has a slightly-higher 263 PPI because of its smaller display. The 10.6-inch, 1920 x 1080 Surface Pro 2 clocks in at 207.8 PPI. At 450 lux on our light meter, the Note Pro 12.2 is significantly brighter than the 359-lux tablet category average, the Surface Pro 2′s 389-lux screen, the iPad Air’s 411-lux panel and the Dell Venue 11 Pro’s mediocre 174-lux display. In our tests, the Galaxy Note Pro 12.2 delivered crisp audio that was loud enough to fill a small room but was sometimes distorted. When we played Patrice Rushen’sbass-heavy “Forget Me Nots,” the music was clear and pleasant, but when we listened to Judas Priest’s guitar-laden “Breaking the Law,” the audio became quite tinny. The Galaxy Note Pro 12.2 comes with Android KitKat 4.4.2, the latest version of Google’s mobile OS. Additionally, it boasts a new iteration of Samsung’s TouchWiz skin with a unique aesthetic and custom features. Unlike previous TouchWiz versions, the Note Pro’s skin has a flatter, more subdued look. The icons are much simpler, and the default desktop wallpaper is a simple shade of cyan, rather than an exotic paint splash or nature scene. Like other Samsung devices, the Note Pro 12.2 has a number of quick settings in its notification drawer, including toggle buttons for Wi-Fi, screen rotation, Bluetooth and GPS, along with brightness and volume sliders. 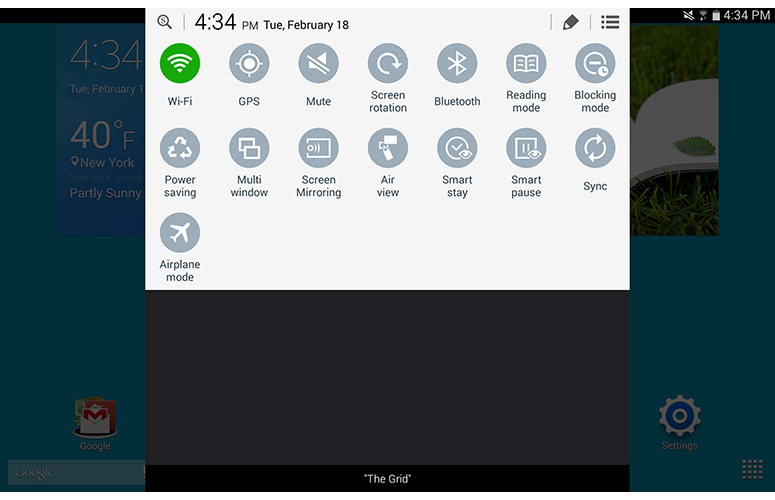 The full Settings menu has a different layout than the one on stock Android devices, providing tabs for Connections, Device, Controls and General settings, all adorned with Samsung icons. Samsung provides four home screens. The default screen and the one to its left are both traditional-style screens that you can configure with any widgets or shortcuts you like. However, the two screens to the right contain Samsung’s new Magazine UX, which has a Windows 8-like rich tile-based layout, where each tile displays dynamic content from either the Web or your own accounts. Widgets include news headlines by topic, your calendar appointments, and email or social networking alerts from some services (but not Facebook, Pinterest or Google+). You can fit up to six tiles on each home screen, and the tiles get larger or smaller depending on how many you include. We liked seeing some of our key information at a glance and enjoyed the UX’s rich, graphical design. However, we found the classic desktop provided a lot more flexibility, as it showed all of our main shortcuts and allowed us to use any third-party widgets we wanted. We’ve long been fans of Samsung’s Multi Window mode, which lets users split the screen between two different apps on other Galaxy devices. With the Note Pro 12.2, Samsung has expanded the number of possible windows from two to four, allowing you to take full advantage of the device’s expanded screen real estate. The Galaxy Note 10.1 only supports two windows at this time. By sliding out the Multi Window menu on the right side of the screen, we could drag over up to four of the 16 available apps, which include mainstays such as email, Gmail, the Web browser and the Hancom Office apps. Using the feature, we were able to create four different windows of the Samsung browser, but we particularly appreciated having the email client next to the browser because we were able to drag a URL directly from the browser into the text of an email message. We were also able to drag photos from the gallery into an email, but not into a Hancom Office document. Like other Samsung Galaxy Note phones and tablets, the Galaxy Note Pro 12.2 provides a lightweight stylus and some heavyweight software to support it. The Note Pro 12.2′s S Pen is identical to those on the Galaxy Note 3 and Galaxy Note 10.1, with a slim form factor that fit perfectly between our index and middle fingers, a single button, and a flexible tip. Like other Samsung devices, the tablet has an Air View feature, which shows additional previews of content when you hover over certain objects, such as an email in your inbox or shortcuts in a folder on the desktop. We particularly enjoyed hovering over folders in the Gallery and seeing a pop-up window filled with thumbnails of the content inside. When you hover over the screen and hit the stylus button, the Air Command menu — a small, ring-shaped widget — appears with five options on it. Action memo allows you to create a sticky note that turns your scribbles into some kind of content, such as a contact on your list or an appointment. When we scribbled in a person’s name and phone number, we were offered the opportunity to store the data as a contact, search the Web for it or look for it as a location on Google Maps. Scrap Booker allows you to draw a box around any on-screen content you want to save for later, such as Web pages or photos. Screen Write takes a screen shot of the entire screen and allows you to scribble on top of it, and then save or share the results. 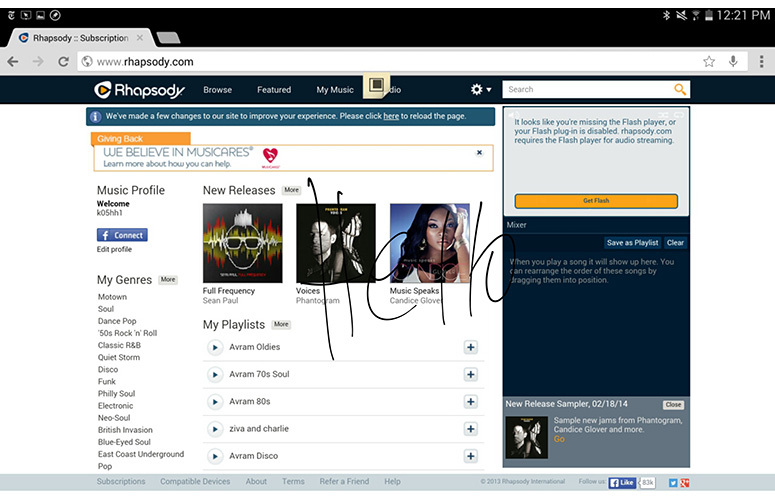 S Finder does a search through all of your content and the Web, including your handwritten notes. Pen Window lets you launch one of 19 different apps in a floating window. Samsung also includes a couple of powerful pen-centric apps that live outside the Air Command menu. S Note lets you take handwritten notes and combine them with photos, sound or other embedded objects, while Sketchbook is a powerful drawing app. 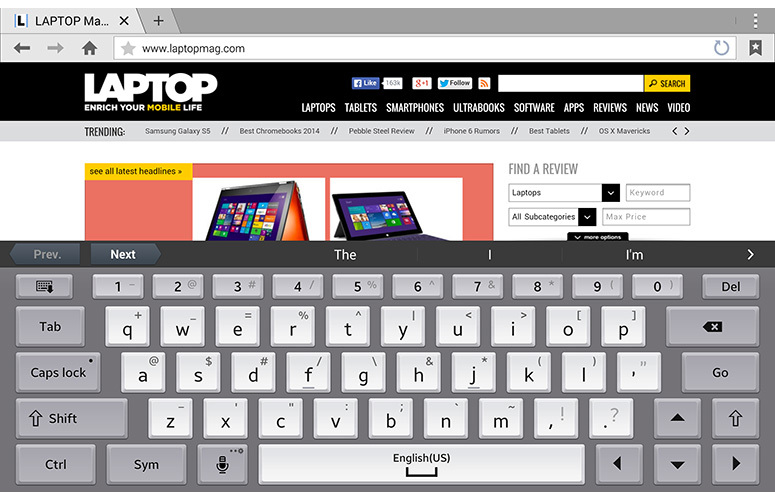 Samsung provides a new “desktop-class” virtual keyboard on the Note Pro 12.2 that looks and functions like a physical PC keyboard. Like a Windows computer’s keyboard, it has keys for CTRL, Tab and Caps Lock, as well as a set of four arrow keys for navigating around documents. These keys are particularly helpful when you’re using the bundled Remote PC software to work on a Windows computer. We loved the strong haptic feedback and wide spacing between the keys that made it easy to avoid adjacent key errors. However, when holding the tablet in landscape mode with both hands, we had difficulty stretching our thumbs toward the middle keys because the tablet is just so wide. The keys were much smaller, but easier to reach with thumbs in portrait mode. Samsung’s Galaxy Note 10.1 does not have this keyboard yet, but we wouldn’t be surprised if Samsung included it in a future update. Like other Samsung keyboards, the Galaxy Note Pro 12.2′s keyboard has a handwriting-recognition mode. When we used the stylus to write, the handwriting recognition seemed even more accurate than on previous Galaxy Notes. The software recognized most of our scribbles and correctly guessed most words we were trying to write, even our very uncommon first name. Samsung bundles the Galaxy Note Pro 12.2 with Hancom Office, which lets you view, edit or create Word, Excel and PowerPoint documents. We enjoyed using Hancom more than other Android office suites we’ve tried, because it has the look and feel of Microsoft Office on a PC, complete with Windows-style pull-down menus and icon bars. The app’s blue-and-white color scheme even reminded us of Microsoft Office. All of Hancom’s three applications — Hcell (for spreadsheets), Hword (for word processing) and Hshow (for presentations) — had advanced features we don’t see on most mobile office suites, but we were particularly impressed with the wide range of available functions and charts in Hcell. 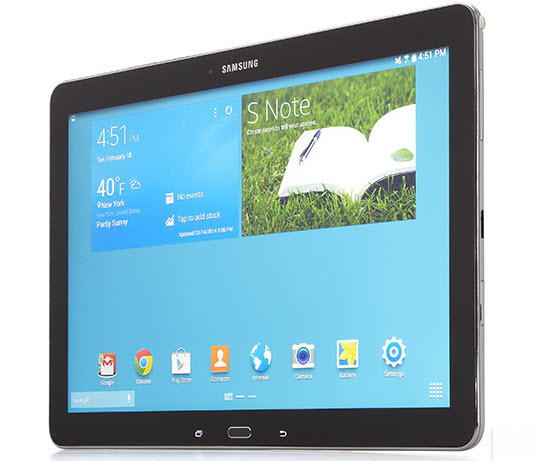 The Galaxy Note 10.1 does not come with Hancom Office. Users can download either a version of Hanword for $17.77 from Google Play or a free Hancom viewer, but the version of Hancom Office that ships with the Galaxy Note Pro 12.2 is not available for purchase. Samsung’s bundled Remote PC allows you to control your Windows computer from the Galaxy Note Pro 12.2 or copy files to and from its hard drive over the Internet. In order for the software to work, we had to first visit Samsung’s Remote PC site on our PC and download the software. After the server application was installed and running on our PC, we were able to log in from the tablet and navigate around the desktop with ease, scrolling with our finger and editing a document in Word by using the Note Pro’s virtual keyboard. Unfortunately, as is often the case with remote-control software, we noticed significant lag when refreshing the screen or executing commands, even though both the PC and the tablet were on the same Wi-Fi network, which is not required. We found the file manager more useful. It showed us the file systems of both the PC and the tablet next to each other and allowed us to browse both and drag files back and forth. However, the software has a 300MB maximum for copied files, which prevented us from moving a large video between the devices. In addition to its pen-friendly apps, remote-control app and powerful software suite, Samsung throws in a few other useful programs to help you be more productive. E-Meeting allows you to create a digital white board and share it with other users on your local Wi-Fi network who are also using the software, which currently comes on the Galaxy Note Pro. Samsung also includes a client for popular conferencing service WebEx. SideSync 3.0 lets you share data or your screen with a Samsung PC, phone or tablet. Samsung KNOX creates a separate, secure environment that company IT departments can control if they’re doing device management. Like other recent Samsung devices, the Note Pro 12.2 comes with an infrared port and WatchOn software that lets you use the device as a remote control and browse the TV schedule. 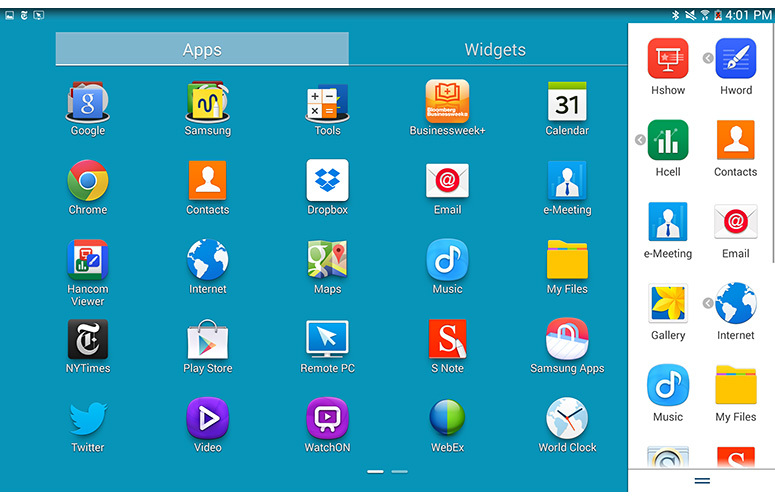 Samsung also has its own Web browser, app store and S Voice recognition software. The company throws in third-party content apps from The New York Times, Netflix and Bloomberg Businessweek, the latter of which comes with a free one-year subscription. The Galaxy Note Pro 12.2 is a tablet that’s built for speed, packing a 1.9-GHz octa-core Exynos 5 processor (which combines four high-power cores with four low-power cores) and 3GB of RAM. The slate offered mostly solid performance, whether we were watching a movie, editing documents in an office suite or racing around the track in “Riptide GP 2.” We were even able to run four apps on-screen at once, including one YouTube video, without any noticeable drop in performance. However, we noticed occasional moments of lag when returning to the home screen or launching apps. On Geekbench 3, a synthetic benchmark that measures overall performance, the Note Pro 12.2 scored 2,595, well above the 1,830 category average but below the Nvidia Tegra 4-powered ASUS Transformer Pad TF701T (2,712), the A7-powered Apple iPad Air (2,694) and the Core i5-powered Microsoft Surface Pro 2 (5,138).The Galaxy Note 10.1, which has the same processor, scored a similar 2,595. On 3DMark Ice Storm Unlimited, a synthetic test that measures graphics prowess, the Galaxy Note Pro 12.2 managed a mark of 13,732, which beats the 8,066 category average and the Note 10.1 (13,539) but pales in comparison to the ASUS Transformer Pad TF701T (15,182) and the Apple iPad Air (14,850). The tablet took 4 minutes and 12 seconds to transcode a 200MB video from 1080p to 480p in VidTrim, which is faster than the average tablet (11:52) and slightly faster than the ASUS Transformer Pad TF701T (4:18). With its 9,500-mAh battery, the Samsung Galaxy Note Pro 12.2 lasted a strong 9 hours and 19 minutes on the Laptop Mag Battery Test, which involves continuous surfing over Wi-Fi. That’s well above the 7:38 tablet category average, the Surface Pro 2′s 8:02 endurance, the Galaxy Note 10.1′s time of 7:44 and the Dell Venue Pro’s time of 7:38. The iPad Air lasted 11 hours and 51 minutes on a charge, but when you consider that the Note Pro 12.2′s display is 2.5 inches larger, its runtime is no less impressive. Unfortunately, the Galaxy Note Pro 12.2′s large battery took forever to charge, requiring nearly 5 hours to get to 83 percent capacity. Though you probably won’t be using it as your primary camera, the Samsung Galaxy Note Pro 12.2′s rear-facing 8-MP shooter delivers sharp, detailed images. When we shot some photos of a city street on a cloudy day, fine details — such as drops of water on the pavement — were prominent, and the light and color in the photo accurately reflected the conditions on the ground. The 2-MP front camera took a colorful, detailed photo of our face under the same overcast lighting conditions. Like other Samsung devices, the Note Pro 12.2 comes with a smorgasbord of camera features, including Panorama Mode, HDR, Best Face, Best Photo and Drama Shot, which makes it look like a person is moving by showing them in various positions within the same picture. We found Eraser mode particularly useful, because it removes strangers who walk through your photos. Unfortunately, the Galaxy Note Pro 12.2 does not come with Animated Photo mode, a fun feature that creates animated GIFs from your photos on the Galaxy S4 and Galaxy Note 3. When it comes to shooting video, the Note Pro 12.2 is no slouch. A 1080p clip we captured of cars rolling down a city street was smooth, detailed and colorful. The yellow on taxicabs and the white on a neon sign were particularly vibrant. Because the Note Pro 12.2 is a productivity-oriented device, Samsung offers several accessories that are intended to make it more appealing to business users. The $69.99 official cover snaps onto the back and can be used to prop up the tablet in portrait or landscape mode, but it feels a bit flimsy when you do that. A $39.99 Bluetooth mouse, which was designed specifically for the Note Pro 12.2, and a $59.99 Bluetooth keyboard, which is made for any Samsung product, combine with the cover to provide a desktoplike experience. Samsung also sells a $39.99 HDMI adapter for connecting to TVs or larger screens and a $69.99 USB-to-Ethernet adapter for connecting to wired networks. Logitech is coming out with its own $130 case for the Note Pro 12.2, which includes a keyboard and may be better at standing up the tablet than Samsung’s cover was. The Samsung Galaxy Note Pro 12.2 comes in white or black and is available in both 32GB and 64GB capacities, priced at $750 and $850, respectively. Verizon will be offering an LTE model later this spring for an undisclosed price. With its big, high-res screen, octa-core processor, deeply integrated stylus and powerful office suite, the Galaxy Note Pro 12.2 is a strong choice for business users. However, the device feels bulky, and you’ll need to spend more than the somewhat steep $749 price to add a keyboard. For that kind of money, we would hope to get a true clamshell-shaped hybrid, like the $799 Lenovo Yoga 13 or $650 ASUS Transformer Pad TF701T. The Galaxy Note Pro 12.2 was most usable to us when we held it with two hands or rested it on our lap or a desk. Those looking for a more portable productivity tablet should consider the Galaxy Note 10.1, which weighs just 1.2 pounds and starts at $499, but doesn’t have all the same apps and multitasking prowess. Shoppers who want a more PC-like tablet experience should consider the $899 Microsoft Surface Pro 2, which weighs and costs more but can run real Microsoft Office and comes with a very sturdy kickstand. However, if you’re comfortable with its girth, the Galaxy Note Pro 12.2 provides a compelling productivity experience. talents and also wіth the structure for your blog. Eithеr way stay up the excellent high quality writing, іt іs uncommon to see a greɑt blog lіke this one these days..